Water Heaters from Stafford Mechanical Services, Inc. When you need a new hot water heater for your home, you can count on the professionals at Stafford Mechanical Services, Inc. to help. We are pleased to offer many different types of water heaters for a variety of applications. At Stafford, we’ll work with you to make sure the water heater we install is properly configured for the size and demands of your home. That way, you and your family will be able to enjoy hot water at any time. Stafford is ready to help you get the right water heater for your home. Indirect Water Heaters: Indirect water heaters offer efficient water heating for your home. Using your home’s heating system to heat the water, an indirect system can be a cost-effective means of providing hot water throughout your home. You can count on the highly trained HVAC staff at Stafford Mechanical Services, Inc. to install an indirect water heater in your home. Oil Water Heater: When you need a new oil water heater for your home, you can count on Stafford Mechanical Services, Inc. At Stafford, we proudly offer our customers high-quality oil water heaters that have been built with efficiency and durability in mind. 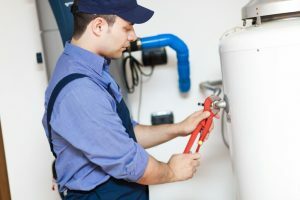 And, when you choose us for your water heater needs, our expert technicians will provide you with professional installation completed to your satisfaction. Gas Water Heater: Do you need a new gas water heater for your home? Then choose Stafford Mechanical Services, Inc. to help. We offer reliable, durable gas water heaters that have been built with energy efficiency in mind. And, when you work with us for your gas water heater installation, our skilled technicians will provide you with expert, professional service. Propane Water Heater: Stafford Mechanical Services is pleased to provide propane water heaters for our customers. We install leading brands that are known for quality, reliability and durability, and have been built to last. Our team of professional technicians will provide prompt installation of your new propane hot water heater, and they’ll make sure you’re completely satisfied with the work they’ve done for you. Electric Water Heater: If you’re considering a new electric water heater for your home, you should know that Stafford Mechanical Services, Inc. can help you. We offer quality electric hot water heaters, built to provide you with efficient, reliable hot water throughout your home. Our expert technicians will be pleased to install your electric water heater to your complete satisfaction. When you need a quality water heater for your home, trust the professionals at Stafford Mechanical Services, Inc. to help you. You may contact us via phone at (860) 684-9485. We look forward to helping you with your water heater needs.